In 2014, UNAIDS announced the 90-90-90 treatment targets to curb the HIV epidemic by 2020: 90% of people living with HIV know their HIV status, 90% of people who know their HIV status access treatment and 90% of people on treatment have suppressed viral loads. Monitoring and evaluation are needed to track linkage and retention throughout the continuum of care. We propose a systematic review and meta-regression to identify the different methodological approaches used to define the steps in the HIV care cascade in sub-Saharan Africa (SSA), where most people with HIV live, and to assess the proportion of participants retained at each step. We will include cohort and cross-sectional studies published between 2004 and 2016 that report on the HIV care cascade among adults in SSA. The PubMed, Embase and CINAHL databases will be searched. Two reviewers will independently screen titles and abstracts, assess the full texts for eligibility and extract data. Disagreements will be resolved by consensus or consultation with a third reviewer. We will assess the number and proportion of individuals retained in the HIV care cascade from HIV diagnosis to linkage to care, engagement in pre-ART care, initiation of ART, retention on ART, and viral suppression. The data will be analysed using random effects meta-regression analysis. Publication bias will be assessed by funnel plots. This review will contribute to a better understanding of the HIV care cascade in SSA. It will help programs identify gaps and approaches to improve care and treatment for people living with HIV and reduce HIV transmission. In 2014, UNAIDS proposed the 90-90-90 Fast-Track treatment targets to curb the HIV/AIDS epidemic. These targets stipulate that, by 2020, 90% of people living with HIV worldwide should know their diagnosis, 90% of these people should be on antiretroviral therapy (ART), and 90% of these persons (i.e., 73% of all people living with HIV) should be virally suppressed [1–3]. 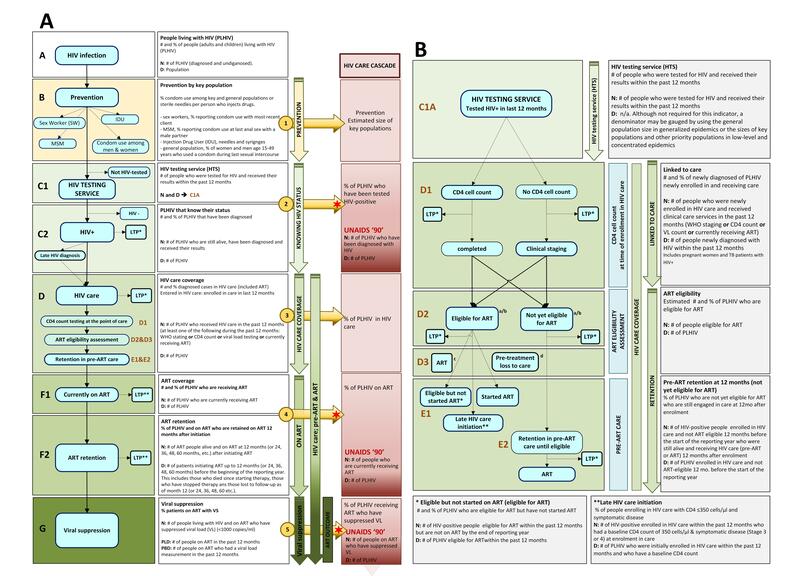 The HIV care cascade, also known as the HIV care continuum, outlines the sequential steps of HIV care from initial diagnosis to the goal of viral suppression [4, 5] (Fig. 1). To achieve universal access to HIV care and treatment with viral suppression, each HIV-positive individual must progress along this cascade. HIV testing services [6, 7], earlier diagnosis [8, 9], linkage and retention in care [10–12] and earlier ART initiation [13–16] are key components to achieve the 90-90-90 goals . The cascade can be used to evaluate HIV programme performance and serve as a monitoring tool to identify gaps and opportunities for specific interventions to improve outcomes . In sub-Saharan Africa (SSA) and elsewhere, significant gaps remain [19–21], and retention along the HIV care cascade remains a major problem [22–27]. However, studies analysing the HIV care cascade use different methodologies and calculations to construct the cascade. For each element in the cascade, either measured or estimated, definitions vary and methods are often not well described . The use of different measures, for example how retention in HIV care is defined or the threshold for viral suppression, to estimate the cascade stages may affect the results . It is therefore difficult to compare published cascades across regions and calendar periods. Few studies have evaluated the methods used to define the HIV care cascade in low- and middle-income countries, or in SSA . A previous systematic review from 2014 looking at the whole cascade from HIV testing to viral suppression failed to identify any eligible studies from low-income countries . A more recent review evaluated the cascade based on national estimates but did not include smaller in-depth studies . In SSA, surveys conducted between 2007 and 2011 found that 36% of people in the region had never been tested for HIV , and less than 50% of HIV-positive persons knew their HIV status . Focusing on SSA, we aim to perform a systematic review and meta-regression analysis to assess the different methodological approaches used to define the steps in the HIV care cascade and to estimate the numbers or proportion of people retained in each cascade step. This systematic review protocol was written following the Preferred Reporting Items for Systematic Review and Meta-analysis Protocols (PRISMA-P) guidelines . The PRISMA-P checklist can be found as Additional file 1. The first aim of this systematic review is to describe the different concepts and methodologies used in the published literature to define the steps in the HIV care cascade in SSA. The second aim is to obtain comparable measures of the number or proportion of people retained in the different steps of the HIV care cascade, based on the findings from the first aim. We will include cohort and cross-sectional studies with data collected between January 2004 and March 2016 in any country in SSA (Table 1). Studies that examine two or more of the following cascade elements will be included: the number or proportion of persons diagnosed with HIV (first UNAIDS 90-90-90 treatment target), linkage of HIV-positive persons to pre-ART care, retention in pre-ART care, initiating ART, remaining on ART (second UNAIDS 90-90-90 treatment target), and virological suppression among persons on ART (third UNAIDS 90-90-90 treatment target). We will include studies of the general population living with HIV. This will encompass male and female participants living with HIV-1 aged 15 years or older. We will exclude studies of patients with specific co-morbidities such as tuberculosis or opportunistic infections. Studies in patients with HIV-2 will also be excluded. If the HIV type is not specified, HIV-1 will be assumed. We will exclude studies of prevention of mother-to-child transmission (PMTCT) as the PMTCT care cascade differs substantially from the general HIV care cascade [33, 34]. We will also exclude intervention studies that examine the effectiveness of measures to improve the HIV care continuum. The primary outcome is the concept, methodology and definition used to identify a reported stage of the cascade. We will describe these narratively and classify studies into suitable groups. We have conducted a comprehensive literature search with the help of two librarians with expertise in systematic reviews. We restricted the search to articles published in English, French and Spanish between January 2004 and March 2016, since the scale-up of ART in SSA started around 2004 [35, 36]. We performed the searches in PubMed, Embase and CINAHL. The Medical Subject Headings (MeSH terms) for HIV and AIDS and key terms ‘cascade’, ‘continuum’, ‘linkage to care’, ‘retention in care’ and ‘ART initiation’ were cross-referenced with terms associated with 62 African countries (Additional file 3 shows the detailed search strategy). We will update the search prior to publication to include any additional eligible papers published after March 2016. All records from our PubMed, Embase and CINAHL searches will be combined, uploaded into the reference management software Mendeley (version 1.15.3) and de-duplicated. We will use Microsoft Excel (version 2016 for Windows, Microsoft Corp., Redmond, WA, USA) to record outcomes of the selection process. Two reviewers will independently screen studies in two stages: title/abstract screening, followed by full text screening. A checklist with the eligibility criteria will be developed and pilot-tested on a random sample of 20 studies. Titles and abstracts will then be reviewed against the eligibility criteria by AG and FV. We will obtain full texts of all potentially eligible articles. Two reviewers will independently apply inclusion criteria (Additional file 4) to the full texts. At both screening steps, we will resolve disagreements by consensus, if necessary through discussion with a third reviewer (CM or ME). We will record all discrepancies on Excel spreadsheets, with reasons for inclusion or exclusion. The PRISMA study flow diagram will reflect this process and detail the reasons for exclusion of studies. We will develop a data extraction sheet to guide data collection. This sheet will direct collection of the definition and methods for each step of the cascade, the results of estimations or calculations and sources of data. The sheet will be pilot-tested by two reviewers (AG, CM) on a random sample of 10 articles and revised as needed. Two reviewers will independently read each article and extract the relevant data. Both sets of data will be entered into Epidata version 3.1 (EpiData Association, Denmark). Any discrepancies in the extracted data will be resolved by consensus, in discussion with a third reviewer (CM or ME) if necessary. We will contact study authors to resolve any information that is not clear. Clinical and laboratory data (CD4 cell counts, viral load, ART regimen, medical circumcision (only men), TB status, other co-infections and comorbidities). The main characteristics of included studies will first be narratively synthesized. Summary statistics will be used to describe study characteristics, including means (standard deviations) or medians (interquartile ranges), and frequencies (percentages). For each step of the cascade, we will calculate proportions with exact binomial 95% confidence intervals (95% CI) and present these in forest plots. We will calculate the between-study variance (tau-squared) and p values from tests of between-study heterogeneity. We expect substantial between-study heterogeneity, and the focus of the subsequent analyses will therefore be on the identification and exploration of sources of heterogeneity. We will explore associations between proportions at each step and country, setting (e.g. urban, periurban, rural; health care level, public or private setting) and study characteristics (e.g. study size, sampling frame) using random intercept logistic meta-regression (Binomial-Normal) models. These models avoid the biases that arise when Normal-Normal models (which model the within study variability via normal approximations) are applied to logit or arcsine-square root transformed proportions [40, 41]. Where appropriate, we will use the same models to calculate combined estimates of proportions. All analyses will be done in R version 3.2.3 (R Foundation, Vienna, Austria). If data are missing in key variables, we will contact the study authors for clarification. A description of missing data will be provided for each study, and we will discuss the possible implications of missing data. Two pairs of reviewers (AG and CM) will assess included studies using ROBINS-I, a tool for assessing risk of bias in nonrandomized studies of interventions for observational studies . The tool will be adapted to the context of this systematic review, and to cross-sectional studies. ROBINS-I contains 34 questions from seven different bias domains. For each study, relevant domains of risk of bias will be graded as low, moderate, serious, critical or no information for risk of bias . Publication bias will be assessed by visually inspecting funnel plot asymmetry and by including study size in the logistic model. The quality assessment will be cross-checked, and any disagreement will be resolved within the review team. This systematic review and meta-analysis will contribute to a better understanding of the different methodological approaches used in sub-Saharan African countries to define the steps in the HIV care cascade and to estimate the numbers or percentages of people retained at each step of the cascade. We will identify gaps in the cascade and areas for further research. Our results will be useful for the design of strategies for improving the care and treatment of people living with HIV and for reducing HIV transmission. This review will thus be highly relevant to inform health systems interventions and HIV prevention and treatment strategies in sub-Saharan Africa, and low- and middle-income countries in general. We would like to thank our librarians Beatrice Minder and Doris Kopp for their assistance with developing the search strategy and Christopher Ritter for editorial assistance. We would like to give special thanks to the MeSH Consortium Team—James Hargreaves (MeSH Consortium Director) as well as the IeDEA Collaboration (International Epidemiologic Database to evaluate AIDS). No funding has been received for this protocol; it was funded by intramural funds. FV received support from the Bill & Melinda Gates Foundation. The funders had no role in study conception or design, data collection and analysis, decision to publish or preparation of the review. AG and CM were responsible for preparing and registering the protocol. AG, BM and DK contributed to the search strategy. AG, FV, BR, ME and CM provided content expertise and assisted with preparation of the protocol. All authors provided critical revision of the protocol, and read and approved the final manuscript. Joint United Nations Programme on HIV/AIDS (UNAIDS). 90-90-90—an ambitious treatment target to help end the AIDS epidemic. Geneva: UNAIDS; 2014. www.unaids.org/sites/default/files/media_asset/90-90-90_en_0.pdf. Accessed 14 Aug 2017. Joint United Nations Programme on HIV/AIDS (UNAIDS). 90-90-90—On the right track towards the global target. Geneva: UNAIDS; 2016. http://reliefweb.int/sites/reliefweb.int/files/resources/90_90_90_Progress_ReportFINAL.pdf. Accessed 14 Aug 2017.
WHO. Consolidated guidelines on the use of antiretroviral drugs for treating and preventing HIV infection: recommendations for a public health approach. Second edition. Geneva: World Health Organization; 2016. http://apps.who.int/iris/bitstream/10665/208825/1/9789241549684_eng.pdf. Accessed 9 June 2016. Forrest J. HIV care continuum in Rwanda [MOSA3607 Non-Commercial Satellite] In: 21st International AIDS Conference (AIDS 2016) Knowing your epidemic and knowing your response - maximising routinely collected data to measure and monitor HIV epidemics in sub-Saharan Africa. Canada: Precision Global Health. http://programme.aids2016.org/PAGMaterial/PPT/4934_12196/Sabin,%20AIDS%202016%20Rwanda%20HIV%20care%20Continuum%2090-90-90%20targets%20FINAL.pptx. Accessed 14 Aug 2017.
WHO. Consolidated guidelines on the use of antiretroviral drugs for treating and preventing HIV infection: recommendations for a public health approach. Geneva: World Health Organization; 2013. http://www.who.int/iris/bitstream/10665/85321/1/9789241505727_eng.pdf. Accessed 14 Aug 2017. Joint United Nations Programme on HIV/AIDS (UNAIDS). The UNAIDS gap report. Geneva: UNAIDS; 2014. http://files.unaids.org/en/media/unaids/contentassets/documents/unaidspublication/2014/UNAIDS_Gap_report_en.pdf. Accessed 14 Aug 2017. Joint United Nations Programme on HIV/AIDS (UNAIDS). Global Report: UNAIDS report on the global AIDS epidemic 2013. Geneva: UNAIDS; 2013. http://www.unaids.org/sites/default/files/en/media/unaids/contentassets/documents/epidemiology/2013/gr2013/UNAIDS_Global_Report_2013_en.pdf. Accessed 14 Aug 2017.
WHO. Consolidated strategic information guidelines for HIV in the health sector may 2015. Geneva: World Health Organization; 2015. http://apps.who.int/iris/bitstream/10665/164716/1/9789241508759_eng.pdf. Accessed 14 Aug 2017. Sterne JAC, Higgins JPT, R.G. E, Reeves BC: Risk of bias in non-randomised studies of interventions (ROBINS-I): detailed guidance, updated 12 October 2016. Available from http://www.riskofbias.info. Bmj-Brit Med J. 2016;355.